The countdown is officially on for 2011 tax season. If you haven’t filed yet, you have one month to do so. If you itemize, don’t forget about those charitable deductions – ESPECIALLY all of your drop-offs of gently used items to neighborhood charities, thrift and resale shops. Didn’t do any of that in 2011? Turn over a new leaf in 2012 and reward yourself for de-cluttering your home or garage! 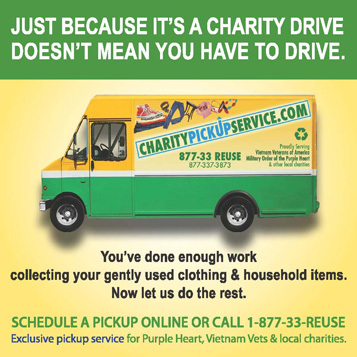 Many places, like the Purple Heart or Vietnam Veterans even pick up at your house, for instance, if you have furniture, or a large volume of give-away bags through www.charitypickupservice.com, which allows you to schedule online. How’s that for an “easy” button? Make sure to photograph the items you’ll be donating and stash a copy along with your charitable receipt for tax purposes. If you do your own taxes and use a tax preparation tool online, look for additional software options, like Turbo Tax’s “It’s Deductible,” which allows you to enter individual items you donated, and then generates the actual acceptable donation value for deduction purposes. Reward yourself for making positive change in your home at the same time you make positive change in your community! This entry was posted on Sunday, March 18th, 2012 at 11:55 AM and is filed under Organization. You can follow any responses to this entry through the RSS 2.0 feed. You can leave a response, or trackback from your own site.